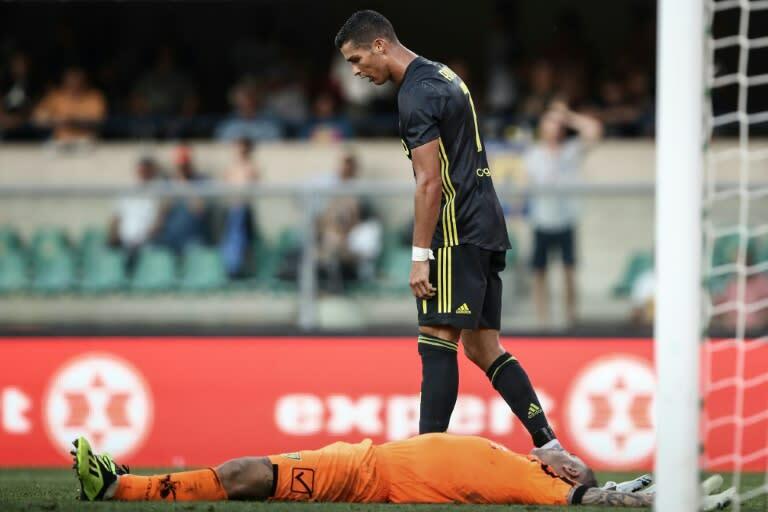 Cristiano Ronaldo may not have scored in his Serie A debut for Juventus but he got a "bullseye" joked Chievo goalkeeper Stefano Sorrentino who suffered a broken nose and whiplash after being knocked out in a clash with the Portuguese superstar. Sorrentino, 39, was hospitalised overnight after losing consciousness on the pitch after his clash with the five-time Ballon d'Or winner in the 87th minute of his team's 3-2 defeat to champions Juventus. The veteran lay motionless on the pitch of the Bentegodi Stadium in Verona where he received treatment before being transported to Verona's Borgo Trento Hospital where he spent the night under observation. "THANK YOU for all your messages of affection and respect," Sorrentino posted on Twitter on Sunday. "We are a fantastic squad and yesterday we had a brush with greatness: meanwhile, CR7 didn't so much brush me as get a bullseye!" Chievo said in a statement that Sorrentino suffered a "nasal bone fracture, contusive trauma to the left shoulder and cervical whiplash." The former Torino and Palermo goalkeeper said he felt pride at having prevented the Portuguese star from scoring. "He is a champion with a capital 'C' who can decide matches at any moment," Sorrentino told Sky Sport Italia. "Before the game I told myself that I should try to stop him in any way I could. "I only found out that the clash was with Cristiano Ronaldo, because I don't remember anything of what happened after going to get the ball only that someone put his hands in my mouth to take out my tongue and then slowly I began to regain consciousness. "Usually it is him to take a foul, I can say that I'm one of the few to have taken a foul from him!" Sorrentino joked. Ronaldo came over to see what was happening and moved away as the medical staff tried to revive the Chievo goalkeeper. The 33-year-old former Real Madrid player posted a photo of himself in the gym the day after the match with the caption: "Buona Domenica" (Have a nice Sunday). Meanwhile, Paulo Dybala apologised for celebrating Mario Mandzukic's Juventus' goal with captain Giorgio Chiellini as Sorrentino lay unconscious, before the VAR ruled it out. Dybala wroted on Instagram: "You're right! I didn't realise what was happening at that moment. I was wrong." Sorrentino may have joked about the incident but his partner Sara Ruggeri was furious. "I tried for hours to keep quiet and focus on what was important, in other words my family," she wrote in a private post on Instagram. "However, if champions want to be called champions, they must first of all be HUMAN BEINGS! I'm sorry, but I cannot admire this champion! "I can admire real men, like my other half who was lying there unconscious and (Nenad) Tomovic trying everything possible to help him! "Thank you to those who have heart, humanity, dignity and principles! Shame on those who insult, criticise, celebrate or even worse observe and then leave!" After Sorrentino's exit replacement Chievo goalkeeper Andrea Seculin immediately conceded the decisive goal from Federico Bernardeschi to get the champions' bid for an eighth straight title off the mark.